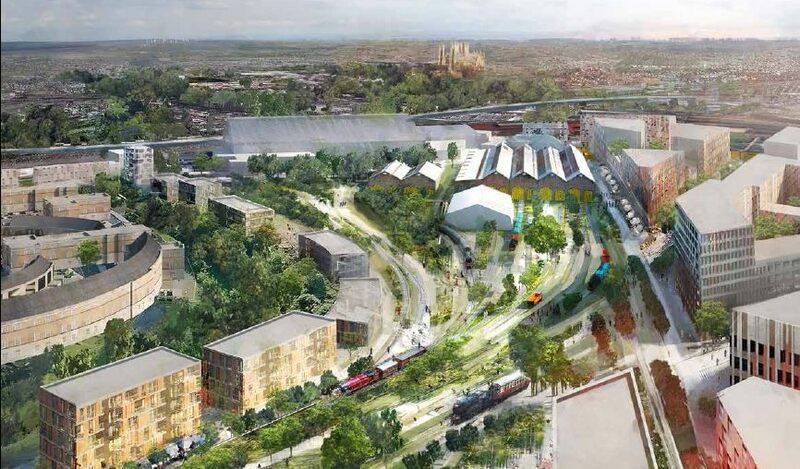 As I hope we all know, the consultation on the teardrop/York Central site — ‘York Central: Seeking Your Views to Guide Development’ — is open for comment, and is closing soon. It was to have ended today, but has been slightly extended, to 18 February. Which is good, as it gives me the opportunity to waffle on about it a bit on here. I suspect/fear that comments and views on the proposals won’t properly reflect the views of York residents, as only a tiny percentage of us will have had the time and energy to properly ‘engage’ with this process, and even fewer will actually record and send in considered thoughts and opinions. If the proposed developments go ahead it will though affect all of us in some way or another. 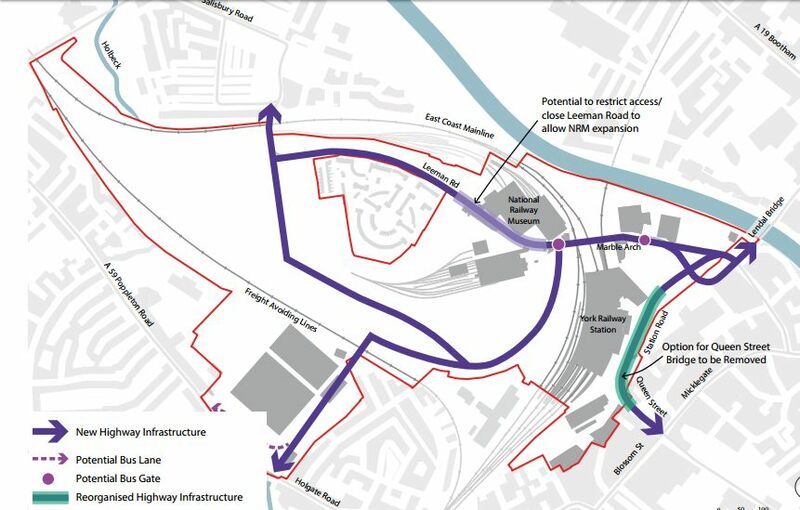 Imagine, for starters, the massive disruption that would result from some of the proposals involving the removal and rerouting of roads, Leeman Road and/or Queen Street. I imagine that there will be many supporters of the NRM’s proposals, which involve rerouting Leeman Road. If I were a visitor to the NRM I might welcome that, but as a resident, particularly if I were a resident who regularly used Leeman Road, I might not. 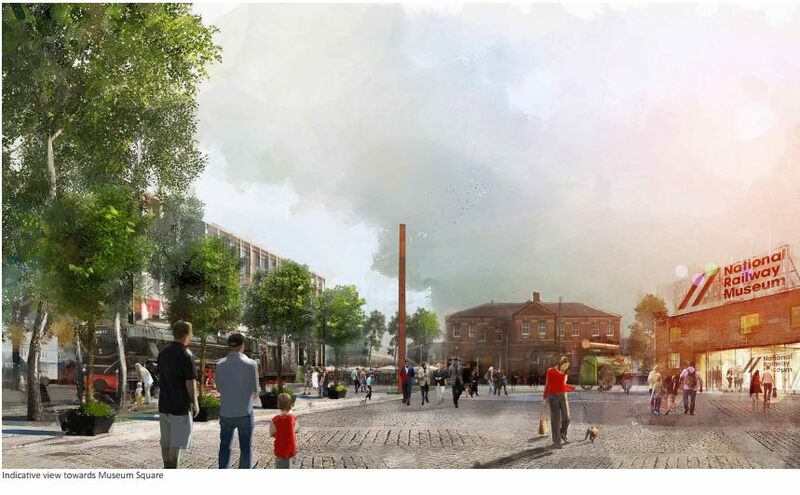 So it’s important that those who are going to be directly affected — people who live and work in York — read up on the plans and comment on the various options. We’re supposed to be excited, aren’t we, about the redevelopment of this enormous brownfield site. I’ve tried, I really have, but I’ve struggled. I thought I’d record a few thoughts and impressions. I’m keen to hear what other people think too — please add your comments below. Particularly if you can make me feel more enthusiastic about the whole thing. All I can see when I look at that is Parliament Street in York. Is it just me? That left side of it — it’s as if we were standing near the dead fountain looking across towards M&S. It’s basically Parliament Street with a bit of a train in it. I hope the public spaces won’t look anything like this early suggestion, all fussy paving and trees in cramped spaces, in lines. Huge light-blocking things. The open space cast into perpetual shade by 10-storey office blocks, lined up on the west to block out the evening sun. Yuck. One of those ‘could be anywhere’ places, with buildings made as tall as possible to maximise the profit from any available bit of land. I’ve tried to imagine how the view towards the Minster might look from the A59 end of Water End, where the road crosses the railway. Somewhat blighted, I suspect. At present it’s one of my favourite views across the city. Still, it’s just a view. And the site will provide much-needed housing, and offices. The comma was important in that sentence. The housing is much-needed, the offices … maybe not? The claim is that ‘the city’s new vision could create up to 7,000 new jobs through a new high-quality office quarter’. Really? The point has been made by some commentators that it seems rather risky and perhaps foolish to be proposing building massive office blocks when there are already fairly modern office blocks still empty or under-occupied in the city. This could be because of their location, I guess, and with some it’s just that they’re dated and don’t fit modern requirements, but might it also be the case that there just isn’t a need for this kind of office accommodation in the 21st century? And that if there is, companies like Hiscox coming in to the city prefer to design and build their own? … he had grave concerns about the speculative construction of offices without tenants signed up. “As a part owner / developer of the last grade A offices ever to have been speculatively built in York -Apollo and Artemis Houses on Eboracum Way – and having had empty floor space since the building was completed nine years ago, I can tell you that this is utter madness. “No one in their right mind would ever propose the building of empty offices in the hope this would attract tenants. Buildings follow demand not the other way round. And then, of course, there’s the issue of what happens to the existing buildings and structures. 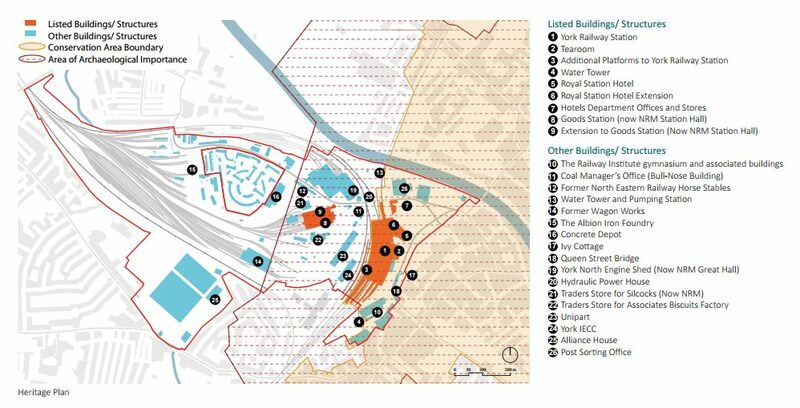 The boundaries of the York Central development extend far beyond the ‘teardrop’ bit. The proposals may have implications for existing buildings on Queen Street, on Holgate Road, Leeman Road, as well as the station itself. I wonder if anyone else has noticed something rather odd/irritating about the representation of the heritage on the site in this image below? Anything missing? I’ll return to this on another page perhaps. Comments can be made via email to: yorkcentral@york.gov.uk and more information can be found at www.york.gov.uk/yorkcentral. If you’d prefer to give your views via the online questionnaire it’s on this link. Deadline for comment is 18 February.